If you need to sell silver coins, silver jewelry, or silver flatware you have come to the right place as Prescott Gold and Silver buys silver coins, silver jewelry, silver flatware, scrap gold, gold watches, class rings, platinum jewelry, gold nuggets, and much more. If it’s made of gold, silver, or platinum, I will buy it. While silver prices are far below gold prices, silver coins, and silver flatware are pretty heavy. A small bag of coins can add up to several hundred dollars in a hurry. 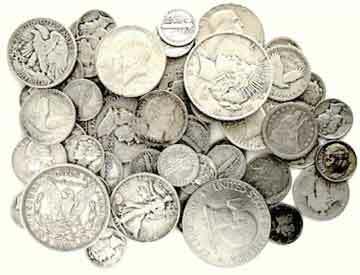 While I hate to see anyone sell their silver coins, if you need to sell your silver, I am always buying US Silver Coins, and others..
We buy Morgan Silver Dollars, Peace Dollars, Mexican Libertads, American Silver Eagles, Canadian Silver Maples Leaf’s, Australian Kookaburra’s, Chinese Panda’s and many other silver bullion coins. While many silver coins have value only for their silver content, occasionally I have a customer bring in a special coin that I can pay quite a bit more than spot price for. Recently I had a customer bring in 2 dimes that I bought for $200.00 each. If you’re thinking of selling silver coins, silver bars, silver rounds, casino tokens, silver jewelry, or any other silver, just call Greg today at 928-710-2137. I’ll meet with you on your schedule. I serve the communities of Prescott, Chino Valley, Prescott Valley, Camp Verde, Cottonwood, Surprise, Payson, Wickenburg, Cave Creek, Anthem, Phoenix, Wittman, and Sun City, Az. if you are in, or visiting Prescott, just stop by to sell your silver.